Bill Kelly, Duck Blind (San Diego: Brighton Press, 2013). Type set in Kabel and printed letterpress on Sekishu and Twinrocker handmade papers. Case bound in hand painted linen and housed in a chitzu. Copy 27 of 50. Graphic Arts Collection GA2013- in process. 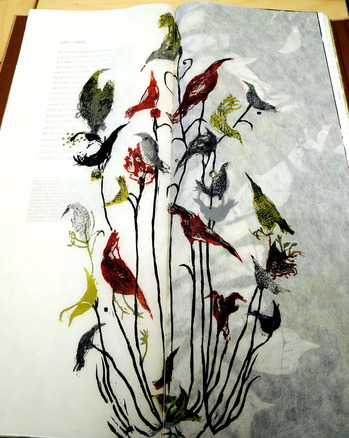 Since 1985, the Brighton Press in San Diego, California, has been creating limited-edition artists’ books under the guidance of director Michele Burgess and founder Bill Kelly. 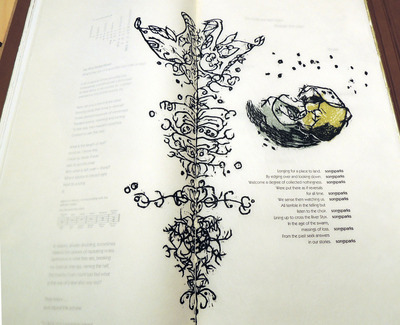 Most works are collaborations between contemporary poets and visual artists, together with artisans in the fields of letterpress, bookbinding, papermaking, printmaking, and sculpture. 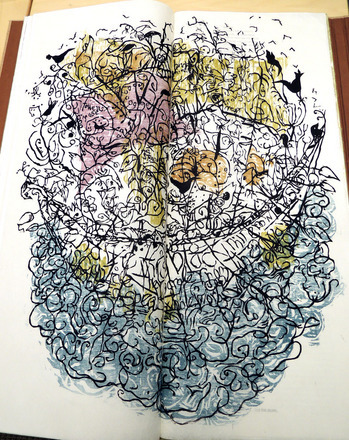 Each work is printed by hand in small editions, signed and numbered by the artists. Over the past three years, Kelly conceived, wrote, carved, and hand printed Duck Blind, inspired by the musicality of language. “I get an image from the sound of the metaphors,” writes Kelly, for whom the text and the image must be seen in concert. 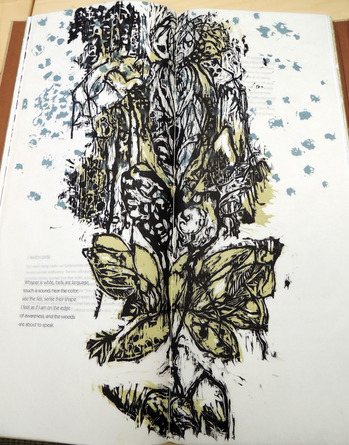 According to the press website, Kelly studied poet Robert Pinsky’s translation of Dante’s Inferno and built his own ‘selva oscura’ (dark forest) through a series of intricate prints and word ruminations. 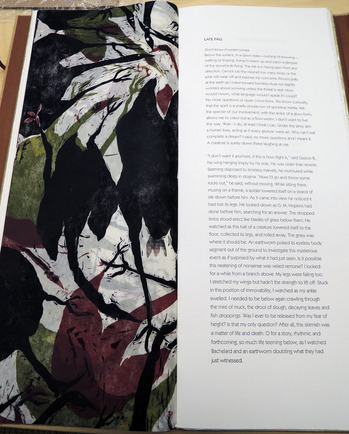 The poetry and prose that make up the text of Duck Blind helped him carve the woodblocks so he could hear his meanings.